Jason Coffman displays a photo of his son Cody outside the Thousands Oaks Teen Center. He came there hoping to find Cody, who was at the Borderline Bar and Grill in Thousand Oaks, Calif., on Nov. 8, 2018. Jason Coffman will miss the fishing trips with his first-born son, Cody. 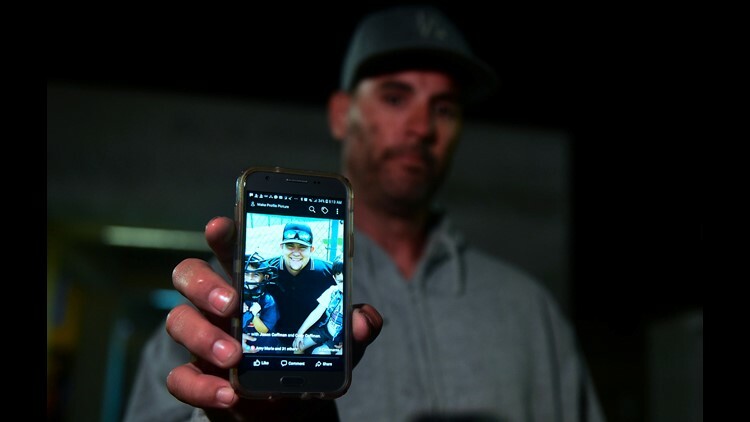 He'll miss his companionship on the baseball diamond and the way his younger sons looked up to Cody, one of 12 people killed by a gunman at a country-western bar in Thousand Oaks, California. "I cannot believe it's happened in my family," Jason Coffman, 41, told reporters shortly after learning Cody had not survived the shooting massacre at the Borderline Bar and Grill. "I am speechless and heartbroken. ... My life has changed now forever." Authorities still haven't named all the victims in the attack, which occurred Wednesday night at the bar about 40 miles west of Los Angeles. Police said the gunman, identified as Ian David Long, opened fire inside the country-western dance bar with a Glock 21 .45-caliber handgun, killing at least 11 victims at the scene. A sergeant with the Ventura County Sheriff's Department later died from his injuries after confronting the shooter. Long was also found dead inside the establishment. The bar was hosting an event for college students and was crowded with 19- to 25-year-olds, Sheriff Geoff Dean said. It was the deadliest mass shooting since 17 students and teachers were killed at a Parkland, Florida, school in February. In the early morning darkness, friends and family rushed to the scene desperately looking for their loved ones. They repeatedly called cellphones, scanned social media sites or urged law enforcement for answers. By late Thursday morning, however, the couple learned Alaina Housley didn't make it out of the bar alive. Vintage principal Sarah O'Connor remembered her as a "natural leader and connector," who was loved by her peers and the school staff. The school is offering counseling support to students and staff. "One of my favorite moments was when Alaina, who played violin in our orchestra, had all of the violinists play happy birthday for her mom one year. Her mom is an employee here," O'Connor told USA TODAY. "She did something special for her mom and she used her musical talent. Justin Meek, 23, never stayed idle. At Coronado High School, he was an Eagle Scout, president of the Octagon Club and captain of the JV water polo team, according to his LinkedIn page. Meek, who graduated from California Lutheran, was working Wednesday night as a security guard at the Borderline Bar and Grill when the shooting started and he died trying to save others, according to the university and several social media postings. "It was his dream to sing at Club 33 at Disneyland and that's never going to happen. It was her dream to sing with him at Club 33, and that's never going to happen – all because of the stupid choice that killer made that robbed so many people of hearing Justin Meek's beautiful voice. It's senseless. "He was loved by so many people. He was just the sweetest guy you'll ever meet. He was the guy you really wanted to have as a friend because of the joy he brought." Jason Coffman also rushed to the scene early Thursday hoping to find his son. Tearful and exhausted, Coffman said he feared Cody ran toward the gunfire, not away from it. "Cody is a tough kid," Jason Coffman told Headline News. "He’s one of the kids to run toward a bully, to stand up for others. I think that’s maybe what he did." Hours later, after being told Cody died in the attack, Jason Coffman spoke to reporters, stifling sobs and leaning on his father-in-law, identified as Mike, standing next to him. Cody was a good older brother to his two younger brothers, ages 8 and 9. Jason Coffman and his wife are also expecting a baby girl, he said. "There are so many people he touched," he said, "who are now going to be as heart- broken as I am." Contributing: USA TODAY Erin Jensen contributed to this report.